Most Atlantic salmon follow an anadromous fish migration pattern, in that they undergo their greatest feeding and growth in salt water; however, adults return to spawn in native freshwater streams where the eggs hatch and juveniles grow through several distinct stages. Irish Record 57 lb taken in 1874 by M. Maher on River Suir. 1. The jaw line extends to the midpoint of their eye (brown trout to the posterior). 2. Salmon parr have no spots on the dorsal fin (trout usually do). 3. The adipose fin in salmon parr is purely grey but tinged red in trout. 4. Salmon parr have a definite forked tail; the trout’s is more rounded). The Salmon Smolt is almost totally silver with black spots on the upper sides and cheeks. They lack the vertical sidebars of the salmon parr or brown trout. 1. Caudal fin may be slightly forked (square and unforked in trout). 2. Caudal peduncle ‘wrist’ is narrow and tapered (thick and stocky in trout). It should be able to pick salmon up using this whilst trout will slip from your grasp! 3. The adipose fin is grey to olive (fringed or spotted with orange or red in trout). 4. Maxillary usually extends to rear edge of eye or slightly beyond (well beyond the rear edge of the eye in trout). 5. Vomerine teeth are small and arranged in a single row along a raised shaft on the roof of the mouth (in trout they are well developed and arranged in zigzag rows along a raised shaft on the roof of the mouth). Fresh-run salmon are blue and silver. At spawning time, the females are dull leaden coloured. The males, which develop a hook (Kype) in the lower jaw, become mottled with red and orange (and are sometimes mistaken for large brown trout). Even I managed to land one! 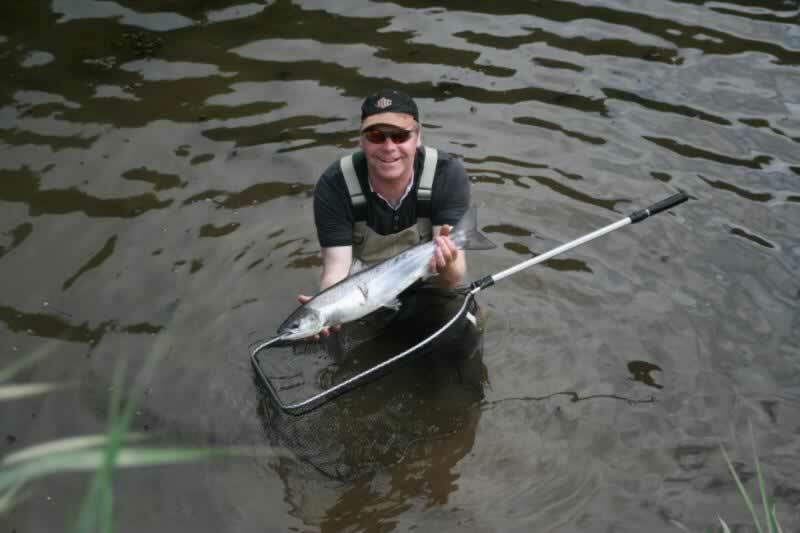 Salmon fishing in Ireland opens on the 1st of January on a handful of rivers. The river Drowse usually succeeds in catching one of the first salmon of the season on opening day. After that varying fisheries open on a variety of dates in February, March, April and May. The vast majority of fisheries close on September 30th with a few open until October 12th. Salmon tend to come into varying fisheries in ‘runs ‘of which there are 3 major runs. The earliest run of salmon are the multi sea winter fish (averaging 9 lbs) and are known as ‘springers.’ The spring run usually starts in March around St. Patrick’s Day, running through until early May. These fish are highly sought after and prized by salmon anglers. 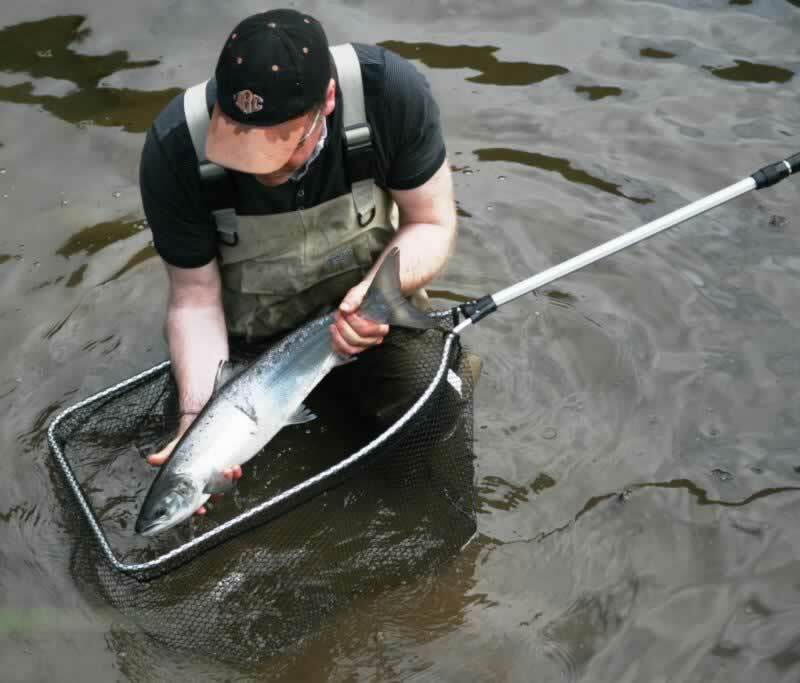 The second run is the largest comprising of grilse or summer salmon. They generally weigh from 3 – 6 lbs and are widely found throughout the country. The timing of the run varies but most begin in June. Irish grilse runs remain some of the most prolific in Western Europe and offer the salmon fisherman the best chance of success. The final ‘autumn’ run usually coincides with the first rains of the autumn. This run often makes up the bulk of the adult salmon returning to any catchment. These fish often ensure productive salmon fishing on many waters right to the end of the season. 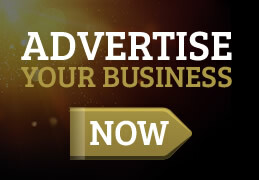 The main methods are, Fly fishing, Spinning and Bait fishing. All methods are subject to both national and local regulation. Both are subject to change and should be checked before fishing. Fly-fishing is the classic Irish way to fish for salmon. 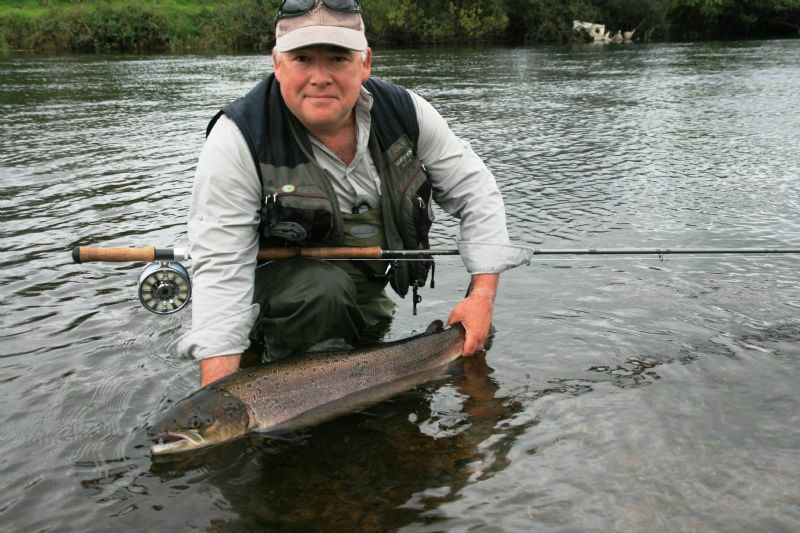 On most Irish rivers anglers need nothing larger than a single handed 11 ft 6 in fly-rod (AFTM 7 / 8) with a floating line. Leaders should be at least 12lb usually a single fly, particularly on rocky rivers. On some rivers such as the Moy or Mourne anglers use the ‘bubble and fly.’ This is usually fished using spinning tackle. Fly-fishing for salmon on loughs is an Irish specialty. Single handed rods to 10 ft 6 in (rated AFTM 7 / 8) are favoured. Salmon are fished for in much the same way as trout. Floating lines with 3 fly casts are standard (10 lb minimum breaking strain). The point fly is often a shrimp fly (seldom larger than size 8), with the droppers consisting of standard trout / sea trout flies size 10 or 12. Spinning is effective when conditions suit. Often in heavy water it can be the only realistic option to catch a fish. 8 - 10 ft rods will cope with most situations and conditions. These are generally fished with fixed spool reels holding at least 100 m of 15lb monofilament / braid. In the early season lures such as Devon Minnows, Rapala or Toby’s, are usually fished slow and deep to get to where the fish are lying. The current popular lure is the Flying ‘C’, with red and black being two of the most popular colours. As the water warms up, standard practice is to reduce lure size whilst speeding up the rate of retrieve. 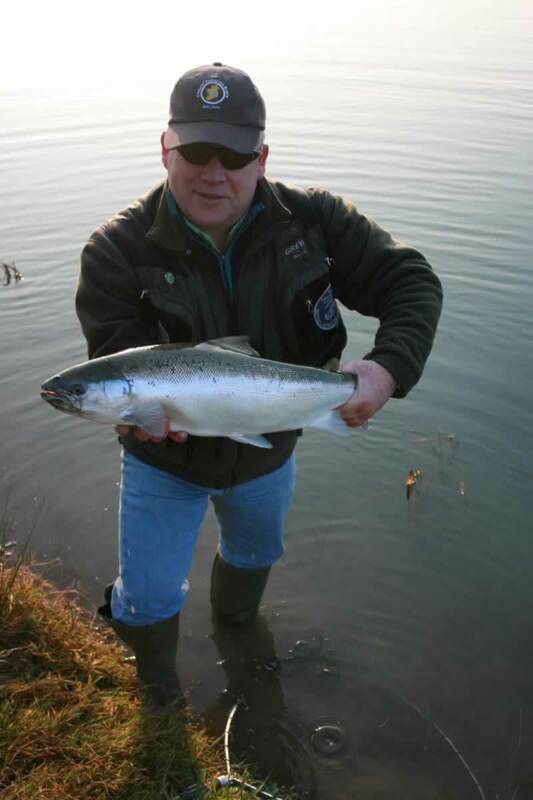 Salmon can also be taken on baits such as shrimp / prawn and worm were rules allow. Prawns and shrimps are effective baits usually fished on a float rig. The trotted worm with or without a float is also an effective method particularly in coloured water. However on many fisheries the use of spinning and or bait is nowhere days banned or at least heavily restricted.